Product #15490 | SKU 8040BPM | 0.0 (no ratings yet) Thanks for your rating! 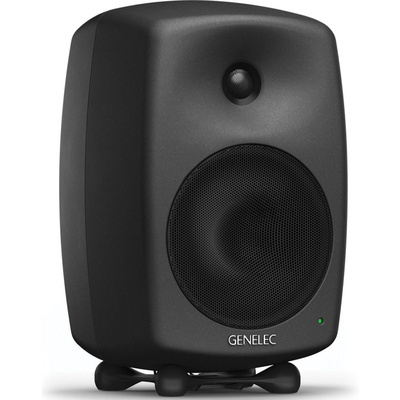 The 8040B Active Two-Way 165 mm Studio Monitor from Genelec provides an accurate reproduction of the source material in a compact form-factor with high output. Its die-cast aluminium enclosure features a rounded shape, which minimises distortions caused by edge diffraction. The metal dome tweeter is surrounded by a smoothly-shaped Directivity Controlled Waveguide, which helps to create an even response when listening both on and off axis. The 8040B is built with Intelligent Signal Sensing (ISS) technology which automatically activates the speaker when an audio signal is detected, and puts it in Standby Mode when no signal is present, reducing the energy consumption to less than 0.5 watts. The 8040B features a 90 watt high frequency amplifier for its 19 mm tweeter, and a 90 watt low frequency amplifier for its 165 mm woofer. The bass response is expanded by a rear-facing reflex port, and a separately available Genelec subwoofer can be used to monitor a wider array of frequencies.